All you need for assembly programming Motorola's EVB! Editing, assembling, correcting errors and downloading s-records can be done without leaving the IDE. MiniIDE is a tool for students and embedded software developers who write software in assembler for Motorola's 68HC11 and 68HC12 microcontroller. MiniIDE is an integrated development environment running under Windows XP or higher. It was especially designed for Motorola's M68EVB912B32 evaluation board and replaces the assembler which comes along with the EVB package. However, it can be used for any evaluation board that has the 68HC11 or 68HC12 on it. MiniIDE incorporates an editor and a serial communication terminal. A command line cross‑assembler, which is seamlessly integrated in the IDE, is included. Click here to view a screenshot. Accepts all common syntax for maximum compatibility with other assembler. Run from the command line or within MiniIDE. The world's fastest assembler in it's class. The popular integrated development environment for the HC11/HC12 can be downloaded at no charge exclusively at MGTEK. 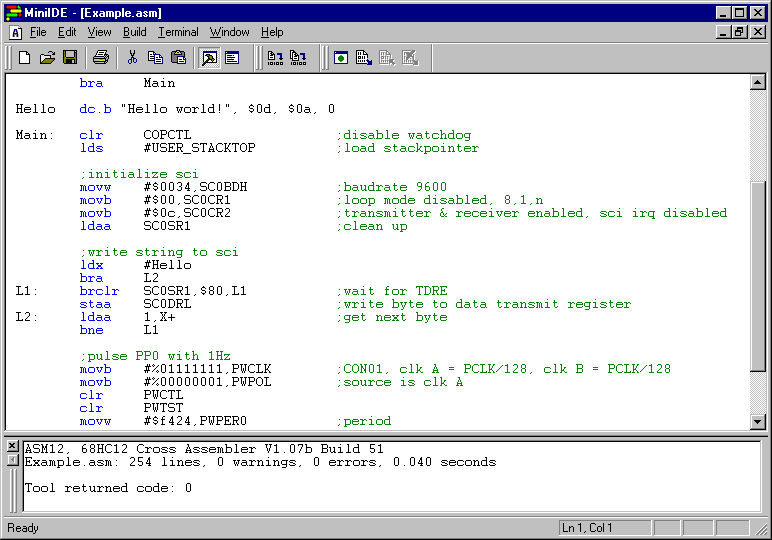 It includes the integrated macro cross assembler ASM11 and ASM12. This Windows Installer package includes the MiniIDE and our ASM11 and ASM12 cross assembler. This section includes pre-build binaries of our popular ASM11 and ASM12 assembler for Linux and HP-UX. The binaries are copyrighted and covered under the MiniIDE license. This archive includes a Linux port of our ASM11 and ASM12 assembler. This archive includes a HP-UX 10.20 port of our ASM11 and ASM12 assembler. Note: These packages do not include the IDE.